“Well, ya see, I’m not saying that I’ve been everywhere and I’ve done everything, but I do know it’s a pretty amazing planet we live on here, and a man would have to be some kind of FOOL to think we’re alone in THIS universe.” Jack Burton said. Alone with his pal in Little China, Jack Burton goes on an adventure of a lifetime. Directed by John Carpenter and also who did the music to the film, Big Trouble in Little China is a great 80’s action movie! What is the plot of this film? 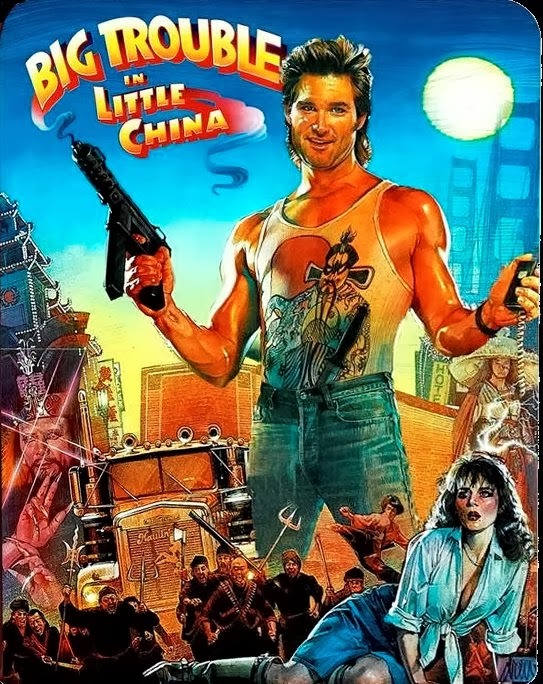 Here it is…Kurt Russell plays hard-boiled truck driver Jack Burton, who gets caught in a bizarre conflict within, and underneath, San Francisco’s Chinatown. An ancient Chinese prince and Chinatown crime lord has kidnapped a beautiful green-eyed woman, who is the fiancee to Jack’s best friend. Jack must help his friend rescue the girl before the evil Lo Pan uses her to break the ancient curse that keeps him a fleshless and immortal spirit. It’s fantasy meets martial arts, with fun and romance along the way. Kim Cattrall also stars in the movie, back when she was really young. The score is a very synthethic feel, with electronic music throughout the movie, but John Carpenter keeps the suspense, mystery and fun all packed in one neat little package. This movie has such a cult following that it developed into a comic book that is still going on. You can find it in your local Comic Book Store. Here is the Amazon link to the score. This is a two disc special edition set that is really over priced. However you can also find the score on ITunes. This one is a lot more reasonable on the price. Well that’s all this week guys, hope you enjoyed it. Next week Ferris Bueller’s Day Off! See you then, and Happy Listening!